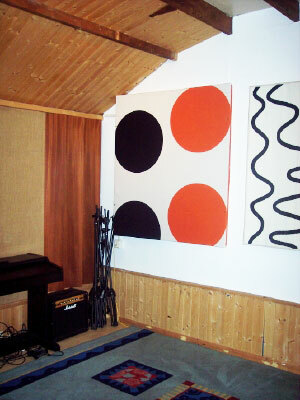 Recording space : 180 sq ft live room with bass trap and amp booth. Separate sound insulated control room. Microphones : Selection includes Audio Technica, Røde, Shure, AKG, M-Audio etc. Mixing : A huge array of Audio Units, RTAS and TDM plug-ins, including McDSP, Sonnox, Waves, Digidesign, Air, TL Audio etc. Logic - Sculpture, ES1, ES2, Ultrabeat, EVP88, EXS24 (sampler with extensive sample library), EVD6, EVB3 etc. Pro Tools - Hybrid, Indigo, Strike, Structure, Transfuser, Xpand2, Velvet, Boom etc. Reason - Redrum, NN19, Dr REX, Combinator, Maelstrom, Subtractor etc. Monitoring : Genelec 8030A Active Speakers. 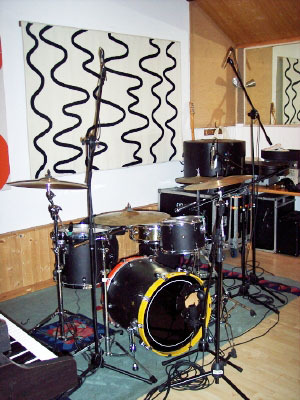 Instruments : Ibanez Roadstar II electric guitar, Line6 Guitar Pod, Session 75 amp, Gibson Epiphone acoustic guitar, selection of percussion, ukelele, Technics electric piano, Roland Juno 60 analogue synth, Yamaha SY35 keyboard, Korg MicroKorg keyboard, Roland JV2080 sound module, Waldorf Pulse analogue synth.